Success can be a fleeting thing, especially in pop music. One minute you're hot, the next you're not - and often there's no clear reason why an act's fortunes changed so dramatically. This week in 1989 on the ARIA top 50, we saw new singles by five artists quite familiar with chart success. For some, their latest release would be a chart disappointment, while others maintained the success they'd previously enjoyed. Among the entries - two follow-ups to number 1 singles that performed very differently, proving the old adage: you're only as big as your last hit. The biggest hit on the singles chart this week in 1989 was still Roxette's "The Look", which spent its sixth week on top. It would also be the final week the song spent at number 1, with a certain US boy band waiting to pounce. You can't half tell that this politically charged lead single from Don's album of the same name was co-written and co-produced by Bruce Hornsby (of The Range fame) - his trademark piano-based sound is stamped all over it. I'm actually a little surprised "The End Of The Innocence", a top 10 hit in the States, didn't do better in Australia since the Eagles drummer/singer had hit number 3 with his 1985 single "The Boys Of Summer", while Bruce had reached number 12 with "The Way It Is" in 1986. Don wasn't done landing hits, but it would be three more years before he'd return to the ARIA top 5. Not ones to disappoint, The Bangles followed up number 1 smash "Eternal Flame" with this minor top 40 hit - maintaining the hit-flop-hit-flop pattern of releases that extended all the way back to breakthrough single "Manic Monday". 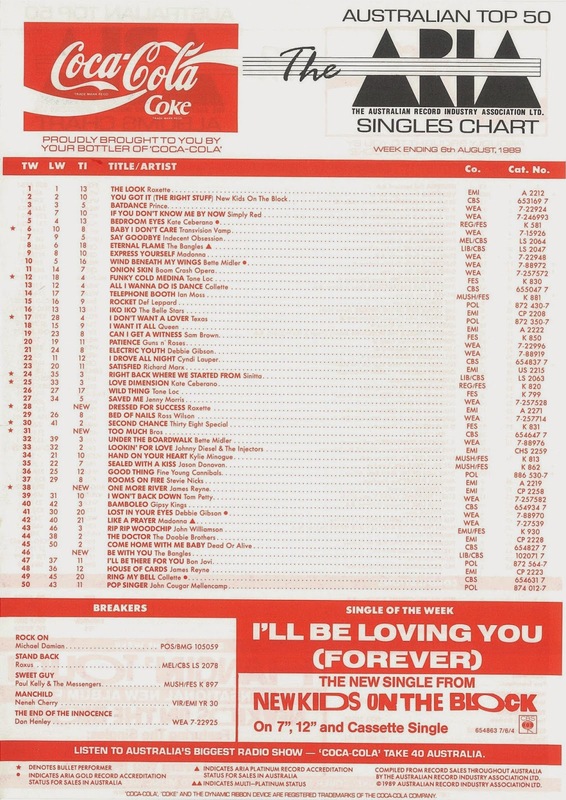 At least "Be With You" made the top 50 - the next (and final) single from the Everything album, "I'll Set You Free", didn't even manage that. Before you knew it, the girl band were releasing a greatest hits album and splitting up. It feels like I'm always writing about James Reyne - but then again he did have a fairly steady stream of singles between 1987 (the first year I started recapping) and 1989. Like The Bangles, James's chart fortunes were rather erratic with his songs either managing to perform quite well ("Fall Of Rome", "Hammerhead", "Motor's Too Fast") or missing the top 50 entirely ("Heaven On A Stick", "Always The Way", the upcoming "Trouble In Paradise"). An exception to the rule was this second single from the Hard Reyne album, which I would've sworn was bigger than its number 22 peak - but perhaps I'm just recalling the saturation airplay it no doubt received at the time. Sixteen months after they debuted on the ARIA chart with "When Will I Be Famous", Bros were back with this first taste of their second album, The Time. Its peak position would suggest that it was business as usual for the pop group, but three had become two following the departure of bass player Craig Logan (who'd go on to date pop stars Kim Appleby and Dannii Minogue, and become a power player in the UK music industry). 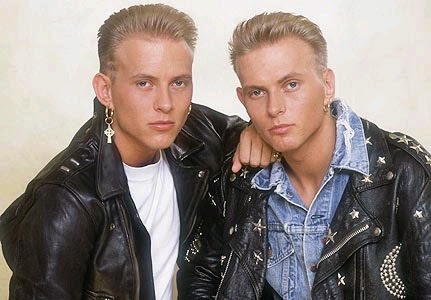 That left twins Matt and Luke Goss - possibly the only hit pop act comprised of just a singer and a drummer. But, while Bros seemed to have navigated their line-up speed-bump without losing speed, the wheels were about to fall off (and I'll leave that extended metaphor there). Success was the right word, since the Swedish duo followed up their reigning number 1, "The Look", with another soon-to-be top 3 hit. Interestingly, in their home country, "Dressed For Success" had actually been the lead single from Look Sharp! - and "The Look" was only single number three (after "Listen To Your Heart"). "Dressed For Success" was the latest chart hit in 1989 to feature the "Wild Thing" guitar riff (or one very similar to it) that had been heard recently in Transvision Vamp's "Baby, I Don't Care" and, of course, "Wild Thing" by Sam Kinison. Next week: New Kids On The Block unveil the second weapon in their pop arsenal, and Australia has a go at hair metal. Plus, a singer celebrates the release of his 100th single - and he was still alive! I loved James Reyne's 'One More River' a great follow up to, and probably even better than, 'House Of Cards'. I remember seeing this as a chartbuster on Countdown Revolution. I thought it was very clever how in the lyrics he says 'pick up the bat phone and dial my number' since the Batman movie was out at that time and doing very well. I wonder if this song was recorded before there was even talk of a Batman movie? Maybe it's just a coincidence or clever marketing? The video has a really summer feel, would it have worked better released later in the year? I dunno. But it had good feel to the warmer months to come. I'm not too familiar with 'Too Much' from Bros. I can't recall seeing the video for it in the day. I do remember 'Chocolate Box' and then that was pretty much the last we saw of them. I have to admit, the only song of theirs that I like is 'I Owe You Nothing' and the video. I only discovered Don Henley's 'End Of The Innoncene' only about 10 years ago on Music Max (when it was called that) on Foxtel. They would play a bunch of songs from a certain year. The song has grown on me over the years, but I can see why it only reached outside the Top 50 after the first listen. His duet in '92 with Patti Smith was a strange pairing (well in my eyes, this was the woman that did vocals on Scandal's 'The Warrior'!) but the song was a great ballad and big hit. To this day, I still cannot comprehend why the Bangles 'In Your Room' was not a Top 10 hit here! I was nearly going to mention the 'batphone' lyric too. I remember noticing the Batman tie-in at the time and wondering if it was pre- or post- the movie. You mean Patty Smyth (all y's) for the duet. Yes, that was a strange pairing, and an even stranger chart smash locally (it sounded a bit too 'American'/country-ish for me to think it would be a hit here). I too thought 'In Your Room' would have done better, but I see why it wasn't a smash. It gets a bit repetitive towards the end IMO, almost like they really had to try to make it hit the 3 minute mark, when it could have just ended earlier. I must've heard the Don Henley track at the time, probably on American top 40, but I have no recollection of it... but the 'this is the end...' line sounds familiar. I found it interesting that the Bangles switched to a Debbi-sung single instead of yet another Susanna one for the third release from 'Everything'. My guess is that the internal politics within the band by the non-Susanna members demanded it. I thought 'Be With You' deserved to do a lot better than it did on the chart, but no doubt another Susanna-led single would have done better. I think I read somewhere that the Vicki-sung (the only member to not have a single released with lead vocal for the whole song) 'Make a Play For Her Now' was going to be the 4th single, if they hadn't disbanded. 'One More River' did receive a lot of airplay in Melbourne; more than 'House of Cards' from memory. Maybe 'One More River' would have done better if it was released in summer; it sounds like a summery song to me. Bros's 'Too Much' had quite a brief chart run for its peak position. I didn't think the song was much cop either, but found Matt Goss's attempt at being Michael Jackson in the verses amusing. I thought 'Chocolate Box' was much better, but by then they were well and truly on the way out. It's strange they had two songs with nearly the same chorus (the other being 'Madly In Love'). 'Dressed For Success' was a much bigger hit than it deserved to be IMO. By far the weakest single from their ARIA top 50 chart entries. Ha Ha Ha. Yes, I meant Patty Smyth. Those 2 always confuse me and the spelling. I had a feeling when I typed it out, I bet I spelt it wrong and have referred to 'Because The Night' singer. You're right about 'In Your Room' getting a bit too repetivite in the end. Susanna's solo debut 'My Side Of The Bed' should have been a big hit too. She deserved solo success. Yes, I liked 'My Side of the Bed' a lot, and it should have been a bigger hit. Though it seems like heaps of 80's pop stars couldn't achieve success as soon as 1990 ticked over. Yes, there are a lot of 80's acts that became casualties of the 90's. Billy Idol is the first that comes to mind. Although he had one big hit in 1990 and that was pretty much it.